I had an assignment this week that required me to interpret Rothko’s Orange, Red, Yellow. This work sold at auction for over $86 million dollars at Christie’s. “1. Mark Rothko has spoken at length about the intent and significance of his artwork.He maintained that the purpose of his art was to convey emotion through color, and that he was not specifically concerned with abstract relationships.With that in mind, his artwork seems to be experimenting with how much an image can be reduced while still having an emotional impact. 2. 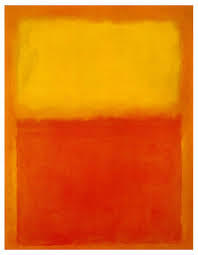 Rothko’s artwork breaks with most of the culturally-accepted norms of “good art”.There’s no attempt at depicting the physical world, little real skill in the actual execution, no explicit ideological statement.Rothko makes the case that these factors aren’t necessary for artwork to have an emotional impact on the viewer, and that mainstream art culture’s idea of “great art” isn’t the only way to produce great art.